Let me know if anything is out of place/flavor. +1 for your Krewe! I approve! Looks good, only thing is you need to add one more point of plasm - it's 5 + one more for each Haunt merit point. Also all that is left now is to decide on your Haunt. With 2 points in utility/accessibility, that gets you something between like a basement and a haunted house. So probably some abandoned building smaller than a large house. Maybe a shack, or an abandoned shop, something like that. Also, do you guys want to have a bit of a prologue to get familiar with how your characters will interact? Instead of starting at the carnival, we could start you off at your haunt, and you guys could decide to attend the carnival after some banter and all. So far, things are going towards a abandoned apartment, with a haunted Amroth painting hanging on the wall. Noia I'd need you to roll Dexterity + Stealth to follow the men. EDIT: Actually no it's a contested roll so this is more complex than that. Hit me or DayDay up on Skype. All I wanted to say was that the word for unification in Chinese is easy to write, when Octy said he'd rather write "shattering" backwards. Though "shattering" and "death" aren't the same word anyway. I was hoping an old mystical language would look more... mystical-y. 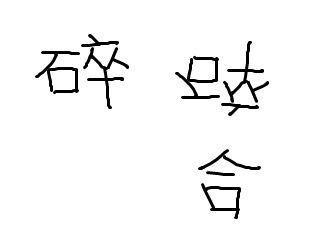 though it does make sense, we don't simply flip 'hao' when we wanna write the word 'bad' in Chinese. I figure that since we've reached a combat point and everybody has a turn order, let's just play out the combat in the thread. Otherwise it'll probably take too long for 1 night anyway. I'll post her actions here, either ST can check it against the ghost's defense rolls. -was a huge (3) success. Actually, the target's defense is deducted from your dice pool before you roll, the target doesn't roll for defense. Sorry, we should've left the ghosts' defense here so you could deduct it. In light of that not being clear, you can keep your 3 successes. The ghost takes 3 points of Lethal damage. But for future notice for others, both ghosts have a defense value of 4. So work out your pool of dice for your attack, then subtract 4, then roll and however many successes you get is your damage done. In that case, do you mind putting the hp of the ghosts in here too? it'll probably come in handy. Hm yes, might as well. The ghosts have 8HP (or rather "Corpus". Bashing and Lethal damage are the same to them, as soon as they fill up with either they die and go to the Underworld. It takes Aggravated damage to outright wipe them from existence). The latest haps are in the thread. You can all post your reactions to whatever you've been dealt, I've tried to provide all the necessary information for you all to at least make one post before requiring ST input again. No guarantees me or HH will be around tonight or tomorrow night to progress things otherwise. So I'd like to see if things can progress along nicely with asynchronous posting rather than us all having to be on Skype every time, for the sake of future efficiency. Stigmata Shroud activation, 4 successes. Captain Bianca go! I realize that all mementos (even our Geists' own) give us a small perk in a specific something that's related to the Geist's identity. If it's not cheating, can I have mine be a bonus towards lie detection? xD Like maybe it shimmers when someone's lying. Relevant section from the Geist guidebook is page 212. Been meaning to ask but I kept forgetting. The effect you seem to be talking about shouldn't really be advantageous in such a way. Like how Octy has Frankenstein's coat give off a cool wind - it's an effect, but it doesn't really do anything, unless you were trying to keep your drinks cool. If yours gives bonus to lie detection rolls, then everyone else should get something that gives a bonus to rolls too. Of course, some effects may be advantageous in specific situations. For instance, theoretically Octy could use his coat to try to convince people of some supernatural goings on. I just think a general lie detection power is a bit too useful. If you can think of something a bit more situational or specific, that could work. Perhaps it glows if people lie about their faith in God? I think that's specific enough to be fair, and it would actually apply in this situation. However, if you do go with that, you'll also have to note that your character likely doesn't check the keystone instinctively anytime anyone talks about God (unless you can rationalize why he does, IC), and so you may not even see it glowing (assuming he wears it hanging under his clothes, not outside). In that case, I'd have you roll Wits+Composure to see if you happen to notice it glowing under your shirt. In the event all that works out like that, you'd get +2 to the roll to realize he seems to be pretending that the Bible really means anything to him. However, that all also reminds me each keystone should have a skill tied to it, similarly. You can then boost that skill temporarily, by spending 1 point of plasm per dot. Octy chose Occult for his, but as far as I can see the rest of you either didn't choose or at least didn't mark it in your sheets. Hulk: Throws a dog at Bianca for 1 bashing damage. Gained 3 Plasm from eating the corpse. No Synergy lost. Occult Investigation reveals another 2 Plasm.